You buy this amazing skincare product which apparently works on everyone and deliver fast result, but in the end, you don’t see any improvement on your skin. Sounds familiar? Finding a suitable skincare is a tedious process, mainly because skincare result takes a long time to show on the skin. 99% of the time it is not the product problem because in order to be sold openly in the market, the product has gone through various stages of test. The problem is your skin. You need to treat your skin with a skincare enhancement prior to your skincare routine so that your skin is able to absorb all the benefits of the product. The Elixir Cell Booster is the one I’m currently trying. It contains natural active ingredients that will help increase the vitality of human fibroblasts (the cell which repairs your damaged tissues). It increases the cellular ATP level, an important indicator of cell metabolic rate that facilitate energy production. As a result, it counteracts age-related changes and increases metabolic activity, hence skin started to repair and rejuvenate to a brighter, smoother, moisture and better elasticity skin complexion. The packaging makes it really easy to use. It comes in a pump and all you need is one pump for your face and one more pump for your neck area. As I’ve mentioned, this product is to be used prior to your skincare routine. Because it prepares your skin to receive all the benefits of other skincare you’re going to apply. Just wash your face as usual, apply toner and follow by the Elixir Cell Booster. It comes in gel texture. Dries up fast once applied on skin and leaves matte feeling. You can feel that it is immediately absorbed into the skin and leaves no greasy or wet feeling. I’ve been using this for a week now. It can’t tell exactly if it has improved elasticity of the skin. But there’s one obvious improvement is that my acne scars are reduced and not so obvious after I use this for a week. I hope it will continue doing its job in it because my acne scars are pretty bad. The Elixir Cell Booster is pretty affordable. For first timer, there’s a special price of RM109. The usual price is RM129. 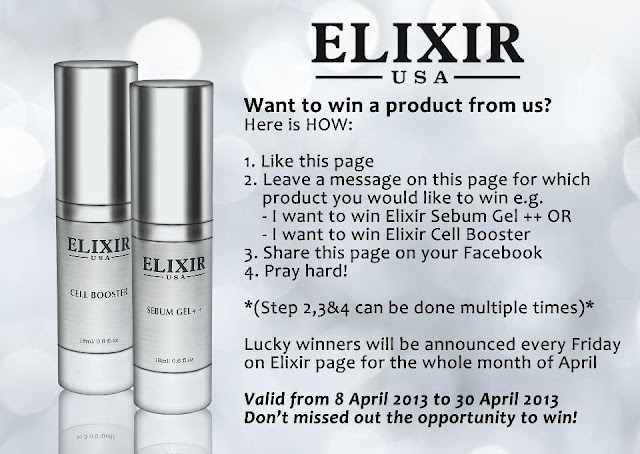 But if you want to try it out without forking out your money first, Elixir is having a contest on their Facebook page currently. The deadline is extended to 3rd May 2013. So, LIKE their Facebook page and you might be the lucky winner.